The club was founded as an amateur side in 1878 and were known as Ipswich A.F.C. until 1888 when they merged with Ipswich Rugby Club to form Ipswich Town Football Club. The team won a number of local cup competitions, including the Suffolk Challenge Cup and the Suffolk Senior Cup. After playing in the Norfolk & Suffolk League from 1899 and the South East Anglian League between 1903 and 1906, they joined the Southern Amateur League in 1907 and, with results improving steadily, became champions in the 1921–22 season. The club won the league a further three times, in 1929–30, 1932–33 and 1933–34, before becoming founder members of the Eastern Counties Football League at the end of the 1934–35 season. A year later, the club turned professional and joined the Southern League, which they won in its first season and finished third in the next. In the top flight for the first time, Ipswich became Champions of the Football League at the first attempt in 1961–62. As English league champions, they qualified for the 1962–63 European Cup, defeating Maltese side Floriana 14–1 on aggregate before losing to A.C. Milan. Ramsey left the club in April 1963 to take charge of the England national team; after the team won the 1966 World Cup, he received a knighthood for "services to football" in 1967. Robson led Ipswich to two major trophies and several seasons in top flight European football. The successful period began in 1973 when the club won the Texaco Cup and finished fourth in the league, qualifying for the UEFA Cup for the first time. In the 1974–75 season they reached the semi-finals of the FA Cup for the first time, losing to West Ham United after a replay, and finished 3rd in the league. By the late 1970s, Robson had built a strong side with talent in every department, introducing the Dutch pair Arnold Mühren and Frans Thijssen to add flair to a team that featured British internationals including John Wark, Terry Butcher and Paul Mariner, although the Ipswich squad perhaps lacked the depth of established big clubs like Liverpool and Manchester United. Ipswich regularly featured in the top five of the league and in the UEFA Cup. At their peak in the 1979–80 season, they beat Manchester United 6–0 in a league game at Portman Road, a game where United goalkeeper Gary Bailey also saved three penalties. The defeat cost United two points – the margin which eventually separated them and champions Liverpool. Major success came in 1978 when Ipswich beat Arsenal at Wembley Stadium to win their only FA Cup trophy. The triumph was followed by a UEFA Cup victory in 1981 with a 5–4 victory over AZ Alkmaar in the two-legged final. The run to the final included a 4–1 win at St Etienne, captained at the time by Michel Platini.. The club also finished as league runners-up in 1981 and 1982. However, the team took only one win in their opening seventeen league games the following season leaving them bottom in December. Despite a good run of form in January and February, Burley couldn't save the club from relegation back to the Championship at the end of the season. The loss of income due to relegation also led to the club going into financial administration. There was the minor consolation of again qualifying for the UEFA Cup, this time via the UEFA Fair Play ranking, and Ipswich survived two ties before losing in the second round proper to Czech side Slovan Liberec. A slow start to the season, culminating in a 0–3 defeat at struggling Grimsby Town, meant that Burley was sacked in October 2002 after nearly eight years as manager. Narrowly missing automatic promotion in 2004–05, Royle again took Ipswich to the play-offs, but once more they lost to West Ham United in the semi-finals. 2005–06 saw Ipswich finish in 15th place—the club's lowest finish since 1966. Joe Royle resigned by mutual consent on 11 May 2006, and a month later, Jim Magilton was officially announced as the new manager. In November 2007, the club were involved in takeover discussions with both businessman Marcus Evans and former Birmingham City director David Sullivan. In December 2007, Evans completed his takeover of the club, purchasing an 87.5% stake in the club, investing around £44 million, which included the purchase of the club's existing £32 million debt. The club agreed a sponsorship deal with the Marcus Evans Group on 20 May 2008, lasting until 2013, the longest in the club's history. After failing to reach the playoffs despite substantial investment, Magilton was sacked in April 2009, and new Chief Executive Simon Clegg replaced him with Roy Keane. Keane's spell as manager came to an end after an unsuccessful 18 months, when he was sacked in January 2011, to be replaced briefly by Ian McParland in a caretaker role before Paul Jewell took the reins on a permanent basis. A poor start to the season with Ipswich bottom of the Championship after winning only one of their first twelve games, led to Jewell leaving his position on 24 October 2012 by mutual consent. He was replaced temporarily by Chris Hutchings for a single match in a caretaker role, before former Wolves boss Mick McCarthy was appointed full-time on 1 November 2012. McCarthy led Ipswich to avoid relegation, taking them from bottom of the league in November to finish in 14th position, 9th the following season and in 2014–15 a 6th place and play-off finish – though the club lost in the semi-finals to local rivals Norwich City. Ipswich ended the 2016–17 season in 16th place, their lowest finish since the 1958–59 season. McCarthy announced that he would be leaving the club on the expiration of his contract at the end of the 2017–18 season on 23 March 2018. However, following a 1–0 victory over Barnsley on 10 April 2018, McCarthy left early and announced his resignation. He was replaced until the end of the season by Bryan Klug as a caretaker manager. Ipswich would ultimately finish 12th at the end of the season. On 30 May 2018, Paul Hurst was announced as the new manager of the club on a three-year contract. Under Hurst, Ipswich made a disastrous start to the season, taking just one win in their opening fourteen league games. Following a 2–0 away loss to Leeds United and with the team bottom of the table, Hurst was sacked in October 2018 after less than five months in charge – making him the shortest serving manager in the club's history. Bryan Klug was given one game in charge as caretaker manager before former Norwich manager Paul Lambert took on the job full time on 27 October. Despite making a number of signings in January, Lambert was unable to turn the team's results around, and the club were officially relegated on 13 April 2019, ending their 17-year stay in the Championship, with them playing third tier football for the first time since 1957. The shirts worn by players of Ipswich Town did not sport a crest until the mid-1960s, when they adopted a design based on the Ipswich coat of arms, featuring a gold lion rampant guardant on a red background on the left half and three gold ramparts on a blue background on the right half. In 1972, the crest was redesigned as the result of a competition, won by the Treasurer of the Supporters Club, John Gammage. Each element of the new design was intended to represent the region. Ipswich Town's traditional home colours are blue shirts with white shorts and blue socks. One of Ipswich Town's nicknames is The Blues, stemming from their traditional kit. The club's first registered colours were blue and white striped shirts with black shorts. All-blue shirts and white shorts were first worn in the 1936–37 season, following the clubs entry into the Southern Football League after turning professional. These have stood as the primary colours of the clubs home kits ever since. Since turning professional, Ipswich have used a number of away colours, including white, orange, red and black vertical stripes, claret and green, cream and black vertical stripes and dark blue and claret. In 2006, the club donated 500 orange and blue-and-white shirts to children in Iraq. In 1981, Ipswich Town announced a sponsorship deal with Japanese based electronics company Pioneer Corporation, who became the first official sponsors of the club. Pioneer Corporation also sponsored the west stand of the club's Portman Road stadium up until 1999, formerly known as the West Stand. Pioneer would continue to sponsor the clubs kits until 1985, when a new sponsorship deal was agreed with local Suffolk radio station Radio Orwell. The radio station would only sponsor the club's kits for a single season before being replaced with pharmaceutical and horticultural chemical manufacturers Fisons. Fisons were the main sponsors of the club from the 1986/87 season through to the 1994/95 season, including the 1991–92 season when the club won the Second Division championship and gained promotion to the inaugural season of the newly founded Premier League. Since then Ipswich have had multiple kit sponsors, including Suffolk based brewing company Greene King from 1995 to 2001, Energy companies TXU Energy (2001–2003), Powergen (2003–2006) and E.ON (2006–2008). After the club's takeover by Marcus Evans in 2007, Marcus Evans Group became the club's new primary sponsor and would go on to be the football club's main sponsor from 2008 until 2018. In January 2018, the club agreed a new three year sponsorship deal worth almost £2 million with British online casino company Magical Vegas. Success on the pitch led to further investment in the infrastructure, with the club spending over £22 million on redeveloping both North and South stands, resulting in a current capacity of 30,311, making it the largest-capacity football ground in East Anglia. In the past ten years, statues of both Sir Alf Ramsey and Sir Bobby Robson have been unveiled outside the stadium. The North Stand was renamed in honour of former manager Bobby Robson in September 2009. On 31 March 2012, in conjunction with celebrations of the 50th anniversary of Ipswich Town winning the 1st Division on their 1st attempt, the South Stand was renamed in honour of Ipswich and England's former manager Sir Alf Ramsey. Portman Road now features two stands named after their two most successful managers in the club history as well as being England's most successful managers. On 10 July 2012, the West Stand, formerly known as the Pioneer Stand and the Britannia Stand was renamed the East of England Co-operative Stand following a sponsorship deal with the East of England Co-operative Society. The East Stand of Portman Road, formerly known as the Portman Stand, is called the Cobbold Stand, named after the former owners of the club. The playing surface at Portman Road is highly regarded and has been voted best pitch in the league on a number of occasions. The former groundsman, Alan Ferguson, received a number of accolades, including both Premiership and Championship Groundsman of the Year. The stadium has also hosted many England youth international matches, and one senior England friendly international match, against Croatia in 2003. A recent nickname for Town is "The Tractor Boys", which was coined during the club's brief period in the Premier League from 2000–01 to 2001–02, when the team regularly competed against more fashionable clubs. The nickname is an example of self-deprecating humour referring to Ipswich's agricultural heritage. The origins of the nickname are not certain, but the first generally accepted use of the nickname was created whilst playing at Leeds United in 2000–2001: Ipswich were winning the game 2–1 and the Leeds fans started chanting, 'We're being beaten by a bunch of tractor drivers.' Barracking by supporters of more established Premiership clubs during Town's spell in the Premiership lent the ironic chant '1–0 to the Tractor Boys' increased potency and publicity, and the nickname is commonly used by the media. Former Town manager Jim Magilton commented, in the local press, that he disliked the nickname and said that it conjured up, 'images of carrot-crunching yokels', while players such as Matt Holland accepted the chant with good humour. Ipswich have a global fan base, with the official Ipswich Town Supporters Club having supporters branches across the world. The club has a particularly strong affiliation with German club Fortuna Düsseldorf, with Fortuna fans making an annual visit to Portman Road since 2003. Ipswich fans also organise visits to the Merkur Spiel-Arena in Düsseldorf to support Fortuna At their home matches. The two clubs have previously organised a pre-season friendly match in Düsseldorf in 2015, which was the first match to be played between the two teams. The club's main rivals are Norwich City. When the two teams meet it is known as the 'East Anglian derby', or, informally, as the 'Old Farm derby', a comic reference to the 'Old Firm Derby' played between Scottish teams Celtic and Rangers and the prominence of agriculture in East Anglia. The series began in the early 20th century, when both clubs were amateur organisations. The first derby was held between the two clubs on 15 November 1902, with the first derby between the two professional clubs taking place in 1939. Locally, much is made of the informal title "Pride of Anglia". Fans claim the title for either winning the East Anglian Derby, finishing highest in the league, having the better current league position, having the more successful club history. Mick Mills holds the record for Ipswich league appearances, having played 741 first-team matches between 1966 and 1982. The club's top league goalscorer is Ray Crawford, who scored 203 goals between 1958 and 1969, while Ted Phillips holds the record for the most league goals scored in a season, 41 in the 1956–57 season in Division Three (South). Allan Hunter won the most international caps whilst a player at the club, making 47 appearances for Northern Ireland during his time at Ipswich. 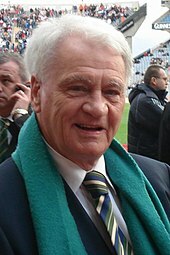 Bobby Robson is the club's longest serving manager in terms of games managed, managing Ipswich for 709 matches between 1969 and 1982. While Scott Duncan is the club’s longest serving manager in terms of time spent as manager at the club, managing the club for 6,487 days between 1937 and 1955. Ipswich still maintain an undefeated home record in European competition. This record being maintained since 1962, when the club first qualified for the European Cup. For 45 years, Ipswich held the record for the longest unbeaten run of games at home in European competition, with a run of 31 home matches undefeated. Due to the team's absence from such tournaments in recent years this record has since been broken by Dutch club AZ Alkmaar. As of 2016, the club runs a Category Two Academy, with a five-year plan to improve to Category One, and is run by Bryan Klug. The academy was particularly successful in the 1990s, producing a number of first-team players including Richard Wright, Titus Bramble and Kieron Dyer. More recently, Andre Dozzell, son of Jason Dozzell, has graduated from the academy, going on to score in his debut for the club in 2016. Towards the end of each season, a player is voted as "Player of the Year" by the fans. For the 2017–18 season, the player of the year is goalkeeper Bartosz Białkowski who won the award for the third straight season. Białkowski is the fourth goalkeeper to win the award and the first winner from Poland. In 2007, the club created a hall of fame into which a number of personnel associated with the club are inducted every year. The inaugural members, Ray Crawford, Mick Mills, Ted Phillips and John Wark, were selected in 2007 by a ballot of former Ipswich players. Bobby Robson managed Ipswich Town from 1969 to 1982. As of 22 April 2019. Only permanent managers are shown. A ladies team affiliated with the club, Ipswich Town L.F.C., currently compete in the FA Women's Premier League South East Division 1, the fourth tier of Women's football in the country. They play their home games at The Goldstar Ground, home of Felixstowe & Walton United. ^ a b c d e f g "History of the Stadium". Ipswich Town F.C. Archived from the original on 3 July 2008. Retrieved 16 March 2007. ^ "East Anglian Derby". Ipswich Town F.C. Archived from the original on 3 May 2008. Retrieved 16 March 2007. ^ Alexander, David (1 November 2002). "Bent relives Ipswich glory days to give Royle perfect start". The Guardian. London. Archived from the original on 31 December 2013. Retrieved 28 April 2013. ^ "A Potted Club History – by Decade – The 1880s". Pride of Anglia. Archived from the original on 27 September 2007. Retrieved 26 March 2007. ^ "Honours by season". Pride of Anglia. Archived from the original on 26 January 2011. Retrieved 20 March 2007. ^ "Southern Amateur League archives – Ipswich Town". Southern Amateur League. Archived from the original on 19 March 2009. Retrieved 20 March 2007. ^ a b c d e f g h i j "Club History". Ipswich Town F.C. Archived from the original on 8 August 2008. Retrieved 16 March 2007. ^ Scott Murray (21 January 2011). "The Joy of Six: Newly promoted success stories". The Guardian. Archived from the original on 4 October 2018. Retrieved 3 October 2018. ^ Karel Stokkermans (17 June 2018). "English Energy and Nordic Nonsense". RSSSF. Archived from the original on 4 October 2018. Retrieved 3 October 2018. ^ Cheese, Caroline (31 July 2006). "World Cup 1966 flashback". BBC Sport. Archived from the original on 10 May 2007. Retrieved 16 March 2007. ^ "Final 1963 / 1964 English Division 1 (old) Table". Soccerbase. Archived from the original on 10 August 2007. Retrieved 16 March 2007. ^ "Final 1967 / 1968 English Division 2 (old) Table". Soccerbase. Archived from the original on 8 April 2008. Retrieved 16 March 2007. ^ a b "History". Ipswich Town F.C. Archived from the original on 7 December 2014. Retrieved 12 December 2014. ^ "United's 10 worst defeats". Manchester Evening News. Archived from the original on 27 September 2007. Retrieved 21 March 2007. ^ "English FA Cup Final – 1977 / 1978". Soccerbase. Archived from the original on 1 October 2007. Retrieved 16 March 2007. ^ "Frozen in time: 18 March 1981". The Guardian. 4 March 2007. Archived from the original on 3 October 2014. Retrieved 23 August 2018. ^ "Ipswich thankful for Thijssen". UEFA. Archived from the original on 20 March 2007. Retrieved 16 March 2007. ^ "Final 1980 / 1981 English Division 1 (old) Table". Soccerbase. Archived from the original on 1 October 2007. Retrieved 16 March 2007. ^ "Final 1981 / 1982 English Division 1 (old) Table". Soccerbase. Archived from the original on 8 April 2008. Retrieved 16 March 2007. ^ "Final 1982 / 1983 English Division 1 (old) Table". Soccerbase. Archived from the original on 31 December 2006. Retrieved 17 March 2007. ^ "Final 1983 / 1984 English Division 1 (old) Table". Soccerbase. Archived from the original on 1 January 2007. Retrieved 17 March 2007. ^ "Final 1984 / 1985 English Division 1 (old) Table". Soccerbase. Archived from the original on 1 January 2007. Retrieved 17 March 2007. ^ "Final 1985 / 1986 English Division 1 (old) Table". Soccerbase. Archived from the original on 31 December 2006. Retrieved 17 March 2007. ^ "John Lyall's managerial career". Soccerbase. Archived from the original on 1 October 2007. Retrieved 17 March 2007. ^ "Ipswich 1992 / 1993 results and fixtures". Soccerbase. Archived from the original on 1 October 2007. Retrieved 19 March 2007. ^ "Final 1992 / 1993 English Premier Table". Soccerbase. Archived from the original on 19 February 2007. Retrieved 17 March 2007. ^ "Arsenal 7–0 Everton". BBC Sport. 11 May 2005. Archived from the original on 6 December 2006. Retrieved 17 March 2007. ^ "Final 1994 / 1995 English Premier Table". Soccerbase. Archived from the original on 8 September 2006. Retrieved 17 March 2007. ^ "George Burley fact file". BBC Suffolk. 17 March 2003. Retrieved 20 March 2007. ^ Francis, Tony (23 February 2003). "Tractor Boys ploughed out". The Daily Telegraph. London. Archived from the original on 14 October 2007. Retrieved 16 March 2007. ^ "Town out of UEFA Cup". BBC Suffolk. 14 November 2002. Archived from the original on 29 November 2002. Retrieved 19 March 2007. ^ "Ipswich sack Burley". BBC Sport. 11 October 2002. Archived from the original on 28 July 2004. Retrieved 17 March 2007. ^ "Royle eyes promotion". BBC Sport. 28 October 2002. Archived from the original on 3 March 2006. Retrieved 17 March 2007. ^ "Final 2002 / 2003 Football League Championship Table". Soccerbase. Archived from the original on 8 April 2008. Retrieved 17 March 2007. ^ "Ipswich exit administration". BBC Sport. 30 May 2003. Archived from the original on 8 November 2003. Retrieved 17 March 2007. ^ "West Ham reach final". BBC Sport. 18 May 2004. Archived from the original on 22 May 2004. Retrieved 19 March 2007. ^ "Championship Play-off 2003 / 2004". Soccerbase. Archived from the original on 1 October 2007. Retrieved 19 March 2007. ^ "Plymouth 2–1 Ipswich". BBC Sport. 30 April 2006. Retrieved 7 January 2008. ^ "Who will succeed Joe Royle?". BBC Suffolk. Archived from the original on 26 May 2007. Retrieved 19 March 2007. ^ "Magilton is new Ipswich boss". BBC Suffolk. 20 June 2006. Archived from the original on 28 January 2012. Retrieved 19 March 2007. ^ "Ipswich agree to sell £44m stake". BBC Sport. 31 October 2007. Archived from the original on 13 January 2016. Retrieved 7 November 2007. ^ "Now Sullivan joins the takeover bidding". East Anglian Daily Times. 7 November 2007. Archived from the original on 7 April 2008. Retrieved 7 November 2007. ^ "Evans completes Ipswich takeover". BBC Sport. 17 December 2007. Archived from the original on 22 December 2007. Retrieved 9 January 2008. ^ "New club Sponsor Revealed". Ipswich Town F.C. 20 May 2008. Archived from the original on 3 July 2008. Retrieved 20 May 2008. ^ "Keane appointed Ipswich manager". BBC Sport. 23 April 2009. Archived from the original on 23 April 2009. Retrieved 23 April 2009. ^ "Roy Keane leaves role as Ipswich manager". BBC Sport. 7 January 2011. Archived from the original on 8 January 2011. Retrieved 7 January 2011. ^ "Paul Jewell leaves as Ipswich Town manager". BBC Sport. 24 October 2012. Archived from the original on 25 October 2012. Retrieved 24 October 2012. ^ "Mick McCarthy: Ipswich Town appoint ex-Wolves boss". 1 November 2012. Archived from the original on 1 November 2012. Retrieved 1 November 2012. ^ "Burnley 2–0 Ipswich". BBC Sport. 4 May 2013. Archived from the original on 7 May 2013. Retrieved 4 May 2013. ^ "Ipswich 2–1 Sheffield Wednesday". BBC Sport. 2 May 2014. Archived from the original on 5 May 2014. Retrieved 3 May 2014. ^ "Norwich City 3–1 Town (4–2 on Aggregate) – Ipswich Town News". Archived from the original on 18 May 2015. Retrieved 19 May 2015. ^ Watson, Stuart (7 May 2017). "The Verdict: Worst season in 58 years – and little light at the end of the tunnel for Ipswich Town". East Anglian Daily Times. Archived from the original on 15 July 2017. Retrieved 7 May 2017. ^ "Mick McCarthy: Ipswich Town boss announces departure in post-match news conference". BBC Sport. 11 April 2018. Archived from the original on 11 April 2018. Retrieved 11 April 2018. ^ Warren, Andy (11 April 2018). "Klug takes caretaker charge of Ipswich Town after McCarthy's departure". East Anglian Daily Times. Archived from the original on 11 April 2018. Retrieved 11 April 2018. ^ "Paul Hurst: Ipswich Town name Shrewsbury boss as Mick McCarthy's successor". BBC Sport. 30 May 2018. Archived from the original on 21 June 2018. Retrieved 30 May 2018. ^ "Paul Hurst: Ipswich Town sack manager after less than five months". BBC Sport. 25 October 2018. Archived from the original on 25 October 2018. Retrieved 25 October 2018. ^ "Paul Lambert is confirmed as Ipswich Town's new manager". East Anglian Daily Times. 27 October 2018. Archived from the original on 28 October 2018. Retrieved 27 October 2018. ^ "Ipswich Town 1–1 Birmingham City: Tractor Boys relegated to League One". BBC Sport. 13 April 2019. Retrieved 13 April 2019. ^ a b "Ipswich Town F.C. kit". Pride of Anglia. Archived from the original on 27 September 2007. Retrieved 19 March 2007. ^ "The Club Badge". Ipswich Town F.C. Archived from the original on 20 July 2008. Retrieved 16 March 2007. ^ "Away shirt proving a hit". Ipswich Town F.C. Archived from the original on 9 April 2008. Retrieved 30 January 2008. ^ "New kit available for pre-order". Ipswich Town F.C. Archived from the original on 9 April 2008. Retrieved 30 January 2008. ^ "New home shirt revealed". Ipswich Town F.C. Archived from the original on 9 April 2008. Retrieved 30 January 2008. ^ a b "Ipswich Town – Historical Football Kits". Retrieved 1 April 2019. ^ "The New Blue Army". BBC Suffolk. 3 February 2006. Archived from the original on 26 January 2012. Retrieved 19 March 2007. ^ "Ipswich Town shirt sponsor history". East Anglian Daily Times. Retrieved 1 April 2019. ^ "Ground history for Ipswich Town". Soccerbase. Archived from the original on 1 October 2007. Retrieved 16 March 2007. ^ "Sir Bobby Robson statue unveiling". Ipswich Town F.C. Archived from the original on 3 July 2008. Retrieved 16 March 2007. ^ "Statue of Sir Alf unveiled – Part One". Ipswich Town F.C. Archived from the original on 8 August 2008. Retrieved 16 March 2007. ^ Duncan Adams (21 February 2012). "What's Portman Road Like?". Ipswich Town: Portman Road. Football Ground Guide. Archived from the original on 5 June 2012. Retrieved 22 March 2012. ^ "Ipswich scoop pitch award again". BBC Sport. 22 April 2005. Archived from the original on 13 January 2016. Retrieved 16 March 2007. ^ Tyldesley, Clive (15 April 2001). "Understated Ipswich begin to betray their excitement". The Daily Telegraph. London. Archived from the original on 14 October 2007. Retrieved 19 March 2007. ^ "Groundsman admits mistakes made". Ipswich Evening Star. 3 January 2007. Archived from the original on 7 April 2008. Retrieved 19 March 2007. ^ "2008–09 Championship Attendances". The Football League. Archived from the original on 23 September 2012. Retrieved 4 October 2009. ^ "League attendance 2008–09". The Football League. Archived from the original on 23 September 2012. Retrieved 4 October 2009. ^ a b "That Was The Weekend That Was: Ipswich chant sows seeds of discontent". The Independent. 4 December 2000. ^ Warshaw, Andrew (3 February 2002). "One in a thousand as Tractor Boys plough on". The Daily Telegraph. London. Archived from the original on 14 October 2007. Retrieved 19 March 2007. ^ Hayes, Alex (18 March 2001). "Reuser keeps tractor boys rolling". The Independent. London. Archived from the original on 13 January 2016. Retrieved 7 January 2008. ^ "Tractor boys making noise". BBC Sport. 19 December 2000. Archived from the original on 13 January 2016. Retrieved 7 May 2017. ^ "Official Ipswich Town Supporters Club Branch Network". Official Ipswich Town Supporters Club Website. Retrieved 4 April 2019. ^ "Supporters Club from Germany Travel to Ipswich to Cheer on Blues". Ipswich Star. 14 January 2017. Retrieved 4 April 2019. ^ "Ipswich Town and Fortuna Düsseldorf fans Set to enjoy historic friendly". East Anglian Daily Times. 16 July 2015. Retrieved 4 April 2019. ^ Atkin, Ronald (19 November 2006). "East Anglia Derby: Grant ready with his shark riposte". The Independent. London. Archived from the original on 30 September 2007. Retrieved 19 March 2007. ^ a b c d "Ipswich Town all time records". Soccerbase. Archived from the original on 1 October 2007. Retrieved 17 March 2007. ^ "Sunderland sign Ipswich striker Connor Wickham". BBC Sport. 29 June 2011. Archived from the original on 27 June 2011. Retrieved 29 June 2011. ^ "The management". Pride of Anglia. Archived from the original on 14 October 2007. Retrieved 16 April 2009. ^ "Ipswich Town – Team". Ipswich Town F.C. Archived from the original on 19 February 2015. Retrieved 30 June 2018. ^ "Management Team". Ipswich Town F.C. Archived from the original on 8 June 2016. Retrieved 8 August 2016. ^ Watson, Stuart (30 March 2015). "Ipswich Town academy director Bryan Klug on 'special' talent, Category One latest, competing with Norwich and being sacked by Roy Keane". East Anglian Daily Times. Archived from the original on 8 August 2016. Retrieved 7 August 2016. ^ Pearce, Steve (4 May 2016). "Andre and Ben fly the flag for Town Academy in U17 European Championship squad". Ipswich Town F.C. Archived from the original on 20 August 2016. Retrieved 8 August 2016. ^ "Sheffield Wednesday 1–1 Ipswich Town". BBC Sport. 16 April 2016. Archived from the original on 19 April 2016. Retrieved 16 April 2016. ^ a b "Bart Retains Player of the Year". TWTD. 29 April 2017. Archived from the original on 5 September 2017. Retrieved 4 September 2017. ^ "Who's Who". Ipswich Town F.C. Archived from the original on 16 October 2018. Retrieved 16 October 2018. ^ King, Elvin (23 March 2011). "Town players in 'Escape to Victory' reunion". East Anglian Daily Times. Retrieved 16 April 2016. ^ "Ladies team". Ipswich Town F.C. Archived from the original on 23 January 2015. Retrieved 23 January 2015.